At yesterday’s Apple event in San Francisco, CEO Tim Cook spoke about the need to bring apps to the TV’s big screen, while introducing the new Apple TV. Today, a new report from Flurry also highlights how apps have edged their way further into our lives, noting that, for the first time ever, the time spent inside mobile applications by the average U.S. consumer has now exceeded that of TV. Traditional cable TV has already been suffering in recent months, as more consumers are cutting the cord or opting never to sign up in the first place for pricey TV packages filled with channels they don’t want, or have time to watch. But while many are turning to online streaming services like Netflix or Amazon to get their TV fix, Flurry’s report indicates that consumers are also spending their time away from TV doing other things – namely, using apps. According to the company’s data, the average U.S. consumer is now spending 198 minutes per day inside apps compared to 168 minutes on TV. That app figure, however, doesn’t include time spent inside the mobile web browser, even though that’s technically an app, too. If it was included, the time spent on mobile devices would reach 220 minutes – or 3 hours, 40 minutes – per day. 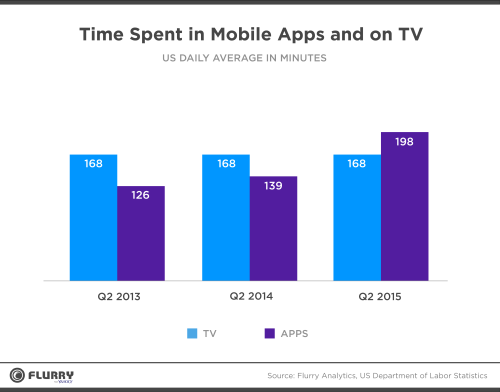 While time spent using apps is increasing, the time spent on TV hasn’t changed from Q2 2014 to Q2 2015, Flurry noted. But it hasn’t grown either. In addition, Flurry points out that it’s hard to quantify how much TV viewing today is dedicated viewing, versus using the TV as background noise while consumers play with apps on their phone or engaging in other “second screen” activities. The report also looked into consumers’ growing demand for content in app format and their willingness to pay – a trend that could encourage traditional media companies to move their content to apps and stream it over-the-top. The firm notes that a number of media and entertainment companies have done well in this area, including Netflix, Hulu, HBO NOW, Spotify and Pandora. Their apps rank highly in the top grossing charts and helped end the gaming industry’s monopoly on App Store revenue. Says Flurry, it’s estimated that this year, revenue from in-app purchases will exceed ad revenue for the first time. In 2014, app stores generated $21 billion (USD) worldwide while the mobile ad industry generated $23 billion. 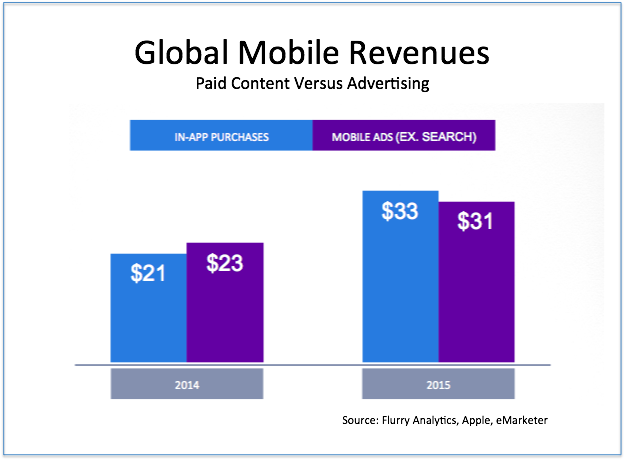 In 2015, Flurry expects in-app purchases to exceed $33 billion and the ad industry (excluding search) to generate $31 billion. Combined, these figures help to create the perfect set of conditions that will help shift TV content away from the cable industry’s grip, and instead moved into apps and streamed directly to consumers. That bodes well, too, for Apple’s continued march into the living room, which began yesterday with the new Apple TV. Although the company didn’t yet announce its rumored TV streaming service, it seems that when the time comes, consumers will be ready to pay.